This recipe makes use of kale stalks that I would normally put in the compost bin. Instead I’ve twice cooked kale stalks with garlic and chilli. Look I’m not trying to put one over on you. I’m not a huge fan of kale. While preparing some kale today for some recipes for the blog, my hubby walked into the kitchen and asked me what I’d killed because it smelt so awful to him. I do like the flavour but the texture unless you prepare this leafy “hungry gap” vegetable properly can be one that challenges even the hardiest of tastebuds. Normally when I’m preparing kale I cut away the stalks and discard them straight into the compost bin. Often woody, the stalks go rubbery if cooked for too long and become a chewy mess if you include them whole in a classic kale dish. I’m not a fan of food waste though so when I was finished steaming some kale leaves I put the (cleaned down) stalks into the steamer for 10 mins. Once steamed for 10 mins I blanched the stalks in cold water, chopped some slivers of garlic and took a handful of my potent dried chillis and flakes from the spice cupboard. In a tablespoon of sunflower oil I lightly fried both the garlic and chillis for a couple of minutes until soft, then added the cold kale stalks. After coating the kale in the mixture of garlic and chilli oil I added 3 tablespoons of soy sauce. Once the soy sauce started to reduce slightly (this took only 2 mins) I spooned the kale stalks out onto a plate and ate straight away. Next time I won’t throw them away! I also trim away those woody stalks and discard them – this sounds like a great way to give them a new lease on life. Thanks for the idea! Brilliant start. I find that if the kale itself is cut small enough then the curliness isn’t so rough. Fascinating. What a great idea – kale is my new favourite thing, so I’ve been discarding a lot of these lately. I love kale but the lads wouldn’t be so hot on it the old fashioned way. Have you tried making chips? I’ve just tried this myself, but had to swap in garlic powder for the fresh garlic, and hand-crumbled frozen dehydrated tomato slices from my garden last summer, in place of chillis. Normally I like the taste of kale, and the stalks. 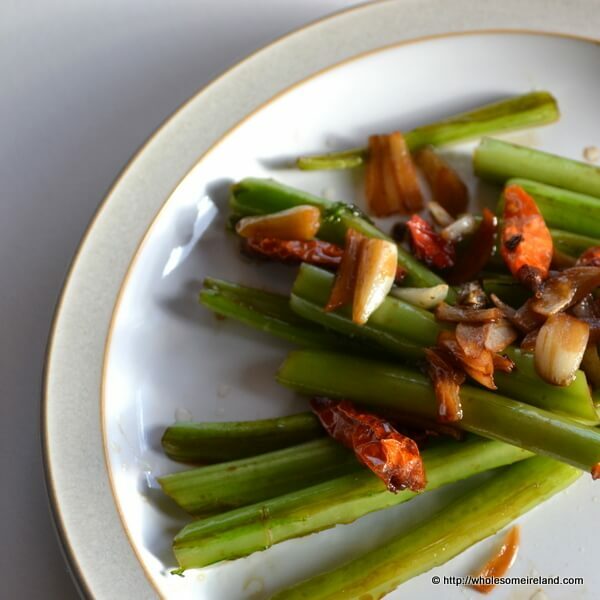 The stalks go well with peanut butter as a quick snack, but wanting something different, your writeup has really hit a home-run for me. Thanks!! By the way, I’ve never really bought kale, it’s only stuff I’ve grown from seed in my garden, after my brother’s addiction to it inspired me. The primary variety I’ve grown is true siberian, which is mostly flat, very minimal ruffling. It grows in huge leaves. It might be much different in flavour to the stuff from grocery stores. Thanks Tom. In truth this past year I bought kale but only because I was temporarily without an allotment. Finally back to growing our own & the difference in flavour is incredible. I don’t know why but I continue to be amazed by the quality! I’m glad you enjoyed the recipe & got the idea of twice cooking the kale. It’s something different for a change. Thank you – this is fabulous. Donnelly’s of Donabate, who sell their Cavollo Nero (that black kale that looks like giant toads’ tongues) to Superquinn, have a delicious recipe on the back of the packet. You chop an onion and put it on the stove in olive oil, just cover it with water and simmer it until the water has almost disappeared. Meanwhile you de-spine the kale and slice it and cook it in boiling salty water. When the onion water is almost gone you drain the kale and mix it in with the onions, with a nice knob of butter. Very very good. I have some Red Russian kale plants about four inches high on the windowsill now; I’m told that a dozen plants will give the family enough greens for the whole winter. I’m a huge fan of the Donnelly’s range. Their cavello nero is outstanding. Thanks for your kind words! Pingback: Collard Greens: Eat 'em raw, just like kale! 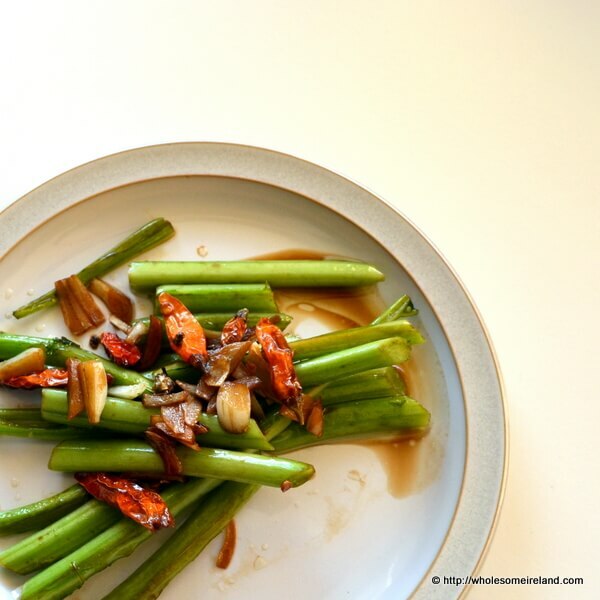 Pingback: 27 Clever Ways to Reuse Food Scraps | Take control of your health!